Arm wrestling may be considered a clash of the strength titans, but in one Russian republic, it is going down a treat with women changing their high heels for high sporting ambitions in the wrestling arena. ­There is little clue as to why the quiet corner of Russia in the North Caucasus hides such a powerful secret. But it is there that one can find perhaps some of the strongest women in the country. And they are hoping their arm wrestling talents will one day be shared with the World, in the Olympic arena. Albina Gusalova began wrestling in 1994, but now she is clearly a super woman with ten world and 14 European gold medals. Born in a small village in the mountains, she says that she has achieved everything she wished for and now it is time for a younger generation to follow in her winning footsteps. Albina's biggest concern though, is that the sport does not get the recognition she feels it deserves. “Sometimes we simply don’t have money to go to the championships. After training so hard young girls are losing the stimulus to continue when they hear that there is no chance for them to go unless they collect the money themselves,” Albina told RT. One thing that might change that would be if the sport was made part of the Olympic Games, bringing more attention and financing. Competitive organized matches began in California in 1952 and soon gained real popularity. 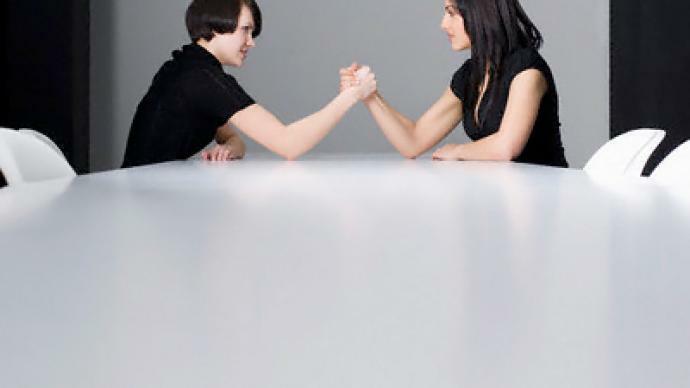 Arm wrestling is one of the most “peaceful” combative sports, which actually does not require any special equipment and people of all ages have a real chance of winning. Despite it seeming quite simple, there are different techniques and tactics. It may be performed sitting or standing, but either way is certainly not an easy task. Spending hours at the gym, Albina`s trainee Luiza Gabueva says she does not know if she will ever have enough money to go to the championships. But she never loses hope. “Maybe it is an incorrect comparison, but sport is like a swamp for me. Once you get into it, there is simply no turning back. I tried to stop, but I can't live without it. And I will continue hoping that one day we will be recognized by the public,” said Luiza. It seems as though Caucasian women are following hot on the successful heels of their men, who take many of the world's medals in almost all types of wrestling. And with girls there seemingly determined to break the stereotypes, we could soon see more and more high heels making their way into the wrestling arenas.